The plasma ball shows up “speak thinking” easily without the use of the electromagnetic induction system as you can see below. It is a high voltage, low current system that generates an electromagnetic field, an electrostatic field (tingling on skin) and even squeezes out a microwave signal in its making. It has all that is needed to energise the body and make audible what you are thinking . It is also a good tool for monitoring the invisible in your living space. How I did this was to have the plasma ball close to me at my foot. I had one end of the cable connected to the line-in to my computer for recording and the other in my palm. My thinking of “jack and jill” was as light as thinking itself and not forced. It was easily translated to sound via the buzz of the plasma ball. 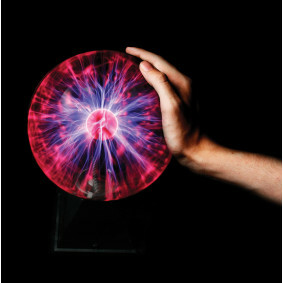 At the centre of a plasma ball is a large alternating voltage, typically a few kilovolts oscillating at around 30 kHz. These fronds of plasma make their way from the centre of the globe to the edge, in a bid to reach earth. Creating an enhanced path to earth by touching the globe increases the strength of the discharge, which is why the arcs are attracted to your hand if you touch the globe. 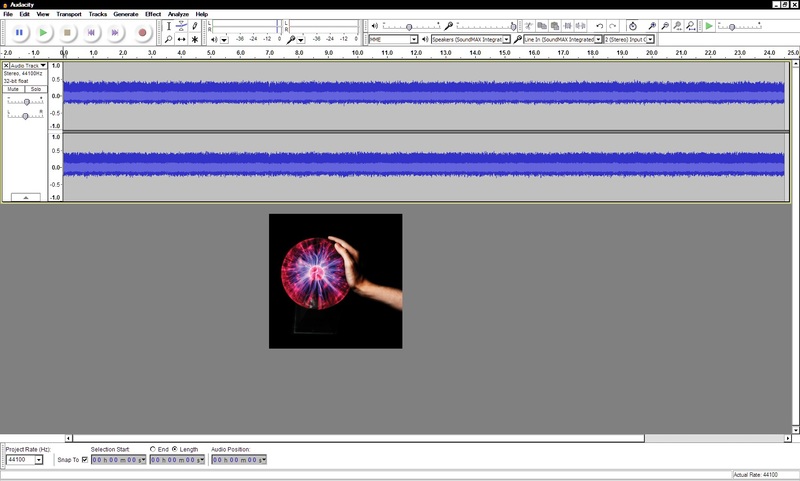 The alternating voltage at the centre creates electromagnetic waves, and the arcs of plasma act as antennae, meaning that the extent of the electromagnetic field surrounding the ball is significantly larger than the bounds of the glass globe. 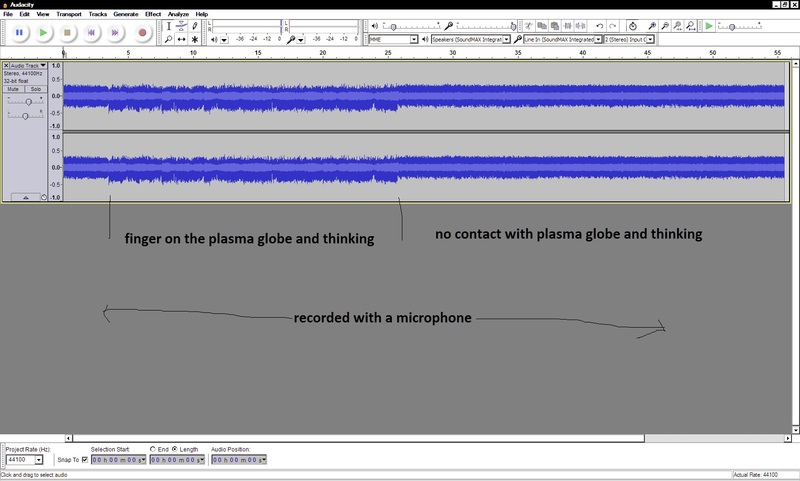 This example below is all the same as above but I recorded with a microphone via audacity in my computer, thinking “jack and jill”. The signal was amplified and could also be listened via bluetooth speakers or via the internet using wireless speakers through your computer/router. Listen to this with a bare end 2 1/4 inch jack near a plasma globe (but not touching it as first too much interference and also it could heat the surface of the globe) amplified signal monitor via bluetooth speakers to listen in to the invisible in you and in your living space. Remember also no thinking here in this experiment as your thinking will be projected into space as a buzzing subliminal that can be “read”. “Speak Thinking” is where one silently speaks what one thinks. You cannot think if you don’t silently speak. It is an anomaly in us for some reason or another it exists. Perhaps it is a means of communication between us where like the plasma balls our electromagnetic aura and its modulations are used to silently communicate with each other via the invisible infrastructure of space itself. As mentioned above it is a good tool for monitoring your space or the invisible in your space. With amplification of silence, and living with the sounds of the invisible, or rather the sounds of the silence you get to see first hand how the subliminals in the air can affect you and how it can affect or alter your thinking without you knowing about it. Hearing has a range of 20 hz to 20 khz and subvocal modulations can come in low and unheard but does get processed by the brain directly into thinking. Unknowingly by you of its source, it will create feelings and emotions that you might not understand. In fact, the sound of silence is not so silent to the brain as it might be to you.. There is but a downside to this. 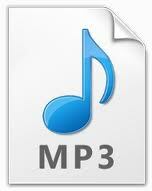 Your thinking your own and private can now be silently translated, amplified and listened too and projected into space. As in the example above, the recording can be passed through an amplifier and projected into space and it would come in to you like it was your tinnitus buzz and you would not thinking nothing of it BUT it would be a projected subliminal to look like you were thinking it. It is a sound thing. The mind would take it in and convert it to thinking. You would have heard it but only as a modulation of a tinnitus buzz in the air. Lets look more closely at the plasma ball. Electromagnetic field. An electrostatic field. a microwave signal. All embedded in the plasma ball. It has all but possibly less of something that is in an EM induction coil system that is used for the hard of hearing. The induction coil does not have that screeching buzz which is very convenient to project a modulated signal. If a plasma ball was close to your refrigerator with its electrostatic and electromagnetic field embedded in the refrigerator it would only take you to think a thing to make your refrigerator to buzz to your subliminal. I spotted this in a shopping mall in my travels. It was a cathode ray TV that had its cables for sound and picture connected to the TV but the opposite end was wrapped around a fluorescent lamp. I noticed that when I was near the lamp there was something of my thinking echoed in the buzz of the picture-less screen of the TV with its sound of white noise that you get from a cathode ray TV that is not connected to its aerial. The little experiences all add up when you want to create the big picture. The plasma ball is a good example of a relatively safe high voltage low current gadget to show you the limitations of your mind and body and soul and to expose the invisible side of you. It is the same principle that is used in the rife machine of its day with its plasma lamps to cure the body using radio frequencies that are generated by the lamps depending on the voltage set for lamps. Sad to say it is being used today silently and openly to generate modulated subliminals and project electromagnetic fields to listen in to your thinking. Your thinking in a projected magnetic field will create a modulated buzz in all the gadgets that are in that room which can then be recorded and processed. Take it as you wish, as there is a positive side to this phenomena. The processing of your thinking and the generating of silent buzz like intuitive subliminals can be used as an educational tool for silent learning if the whole city is wired up with you in it, in the future for a new kind of space you live in. If you look at the plasma ball – it is something of the miniature of the planet earth with its natural magnetic field and electrostatic lightening effects and the subliminals it creates that we never realised before but today has come forth because we are increasingly more so wired up to the space we live in. If you don’t want your inner thoughts to be heard then one should learn to stay silent in mind when it comes to psychological thinking and use thinking only for practical technical purposes. Your inner vulnerabilities are only exposed with personal psychological thinking not when you are trying to think yourself into baking a cake. Being only aware of your surroundings with no thinking is also the other option – choiceless awareness. Living in the now some call it and that is not going past the first second in observation with no thinking and the generation of ideas in the mind. When you internalise these observations about your limitations of the mind you are already in that process of having to “know thyself”. Perhaps that is the ultimate “Truth”. Of knowing oneself completely, and not the generation of ideas, or the “word” or the image or the painting on the wall, but just in dialogue with the process of whatever your passion is in showing you “thyself”. The rest are just illusions of the mind until the “truth” shows itself. That is until you show yourself. Until the facts in you show itself. And then what? anyone’s guess until you get there. You give and take in the search for the “truth” and see “thyself” until you cease to exist and become like nature, and become the essence of the unchanging, omnipresent presence that is both you and it. And art can show you it, if it is your passion of dialogue with yourself and the process. When you see it then you have it, as Jiddu Krishnamurti would have said. All a question of just how far into the ether can you see yourself.